The ports of Grand Haven (shown), South Haven and St. Joseph are expected to be the top perch producers again this year. GRAND RAPIDS — Anglers looking for a fresh perch dinner would do well to keep an eye on southern Lake Michigan and its piers. Unseasonably warm spring weather has prompted a few early runs. 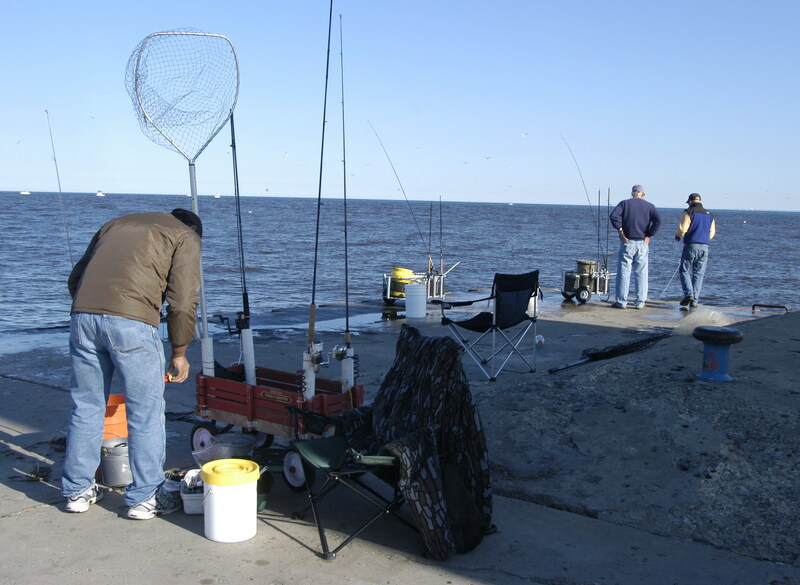 State officials say perch fishing is likely to start earlier than usual, beginning any time this month. “Everything is ahead of schedule this year because of the warm weather,” said Brian Gunderman, a Michigan Department of Natural Resources fisheries biologist at the agency’s Plainwell office. “Perch fishing is three weeks ahead of schedule. At St. Joe, they have been into the piers. In fact, West Michigan anglers began reporting catches of 12-inch perch off Grand Haven on April 1. Anglers in Indiana were enjoying them earlier still. “It’s still a popular fishery, even though it is reduced from what it was,” Gunderman said. The lake’s perch population has been depressed since the late 1990s, so much so that the state cracked down on commercial fishing in 1996 and lowered angler creel limits. The daily limit for Lake Michigan is 50 perch, but south of the 45th parallel (excluding the Grand Traverse bays) it is 35 perch. But creel surveys show that Lake Michigan still provides anglers with 400,000 to 700,000 perch each year. Anglers caught more than 1 million yearly in the 1980s and 1990s. The fishery peaked at more than 2 million in 1994. The perch decline was brought on by a number of factors, including over-harvesting and depressed reproduction. The drop in perch reproduction is linked to diminished plankton levels as a result of zebra mussels. Plankton is not evenly distributed across Lake Michigan, according to state officials. That spottiness, combined with water temperatures and varying input from rivers, accounts for occasional spikes in the catch in places such as Green Bay, Wis.
“We were hoping for 1 million fish (caught) a couple of years ago,” said Dave Clapp, chief for the DNR’s Charlevoix Fisheries Station, “but we have been bouncing around one-half million. “There was no reproduction to speak of in 2011, but there was a good year-class in 2010. The ports of St. Joseph, South Haven and Grand Haven, he said, are expected to be the top perch ports again this season. This entry was posted in Uncategorized and tagged Fishing, Lake Michigan, Perch. Bookmark the permalink.